Acupuncture? An ancient Chinese healing practice where a doctor pokes hair-thin needles into odd places they call “points” on a patient’s body? What does acupuncture have to do with climate change? The issue of climate change touches everyone. Science seems to be the voice of authority. A Google search of “climate change” immediately pulls out these words, “facts you should know”, “evidence”, as well as diagram after diagram of atmospheric CO2 and temperature charts. But climate change seems to involve territory where science has a harder time to claim its all-knowing authority. For one thing, the authoritative voice of science is met with strong denial from the opposite side. For those who listen to the voice of science, climate change evokes intense emotional responses, fear, anger, despair, as well as passion and life-changing purpose. These responses lie in the domain of subjective experience, where the conventional scientific paradigm has largely failed to provide reliable maps and ways to navigate. These emotional, subjective experiences are powerful – as climate change concerns the very foundation of humanity’s existence. Their influence reaches widely diverse populations – as every place on the planet is or will be affected by climate change. Yet, subjective experience is one tenacious “rebel” that defies the command of science. Science in the way we know it is a discipline that studies Hard Reality – stuff that can be measured and quantified objectively with technological instruments. Science in Hard Reality is dominated by a materialistic and reductionist approach. With materialism, we believe that the world is made with Hard Reality materials only. Things which cannot be measured objectively, such as subjective experience, is either not real or a secondary property of Hard Reality stuff. From this view, as long as we understand everything about Hard Reality, we can not only explain but control every aspect of human experience including feeling, instinct, drive, and need. Reductionism views a system as made of parts, and parts are made of smaller parts… reduced all the way down to the smallest possible parts. When we figure out the properties of the smallest parts, we get a handle on how to control the system. In the last 300 hundred years, Hard Reality science first flourished in Europe, reached its peak in America, then swept through one continent after another, riding on the waves of colonization and capitalism. With the tools and powers we conjured out of it, we have treated our natural environment mainly as an infinite source of raw materials. And we reduced these raw materials down to parts, cutting them into bits and using them at our will to meet our ever-expanding desires. The materialistic and reductionist approach not only shapes the natural environment around us, but also profoundly shapes how we see ourselves. Modern western medicine primarily uses this approach to treat the human body. Western medicine breaks the body down into organs, organs into tissues, and tissues into cells. And then it breaks into the cell and discovers that there are different compartments inside the cell. When it breaks into the innermost chamber of the cell, it discovers the large molecules that carry the genetic information of an organism. Bingo! Now that we have the genetic blueprint showing how an organism is made, we can re-construct an organism as we wish! In fact, I was trained in molecular biology. I have first-hand experience what manipulation of the genes can do to lab mice. Applying a materialistic, reductionist approach to Hard Reality is immensely powerful. At the same time, this approach plays a central role in driving us into the dilemma of climate change. Human consumption of natural resources enabled by Hard Reality science has released unprecedented amounts of carbon dioxide into the atmosphere, raising temperatures, melting glaciers, and jeopardizing our own access to clean water, food, and habitats. It also does not address the ever-changing, amorphous human needs in the subjective realm, such as emotional nurturance, sense of belonging, purpose and meaning. If anything, the highly materialistic culture we live in brings on much higher level of mental stress and carves deeper trenches of loneliness that traps us. The limitation of the materialistic/reductionist approach is now acutely felt in the arena of medicine. On the west coast of America where I live, acupuncture and other holistic healing modalities are becoming increasingly popular choices as people’s confidence in western medical paradigm falters. When my first career as a molecular biologist did not feed my heart’s longing for meaning, I switched my career to acupuncture and Chinese medicine. It was my way to reconnect with the broken lineage of my ancestors – both my paternal and maternal grandfathers were in this profession before western medicine became the dominant medical paradigm in China. A materialistic and reductionist view of acupuncture is simply sticking needles into the body. Yet it is far more than that. Acupuncture is the application of a set of perceptual lenses through which my ancestors saw the world. When I peeked through those lenses myself, I saw a world completely different from the lens of Hard Reality science. Let me first describe the view of human bodies through these lenses before I present how this can be relevant to climate change. In contrast to Hard Reality, acupuncture and Chinese medicine is an ancient technology of Soft Reality Science. It primarily employs a trans-materialistic and holistic paradigm. It is trans-materialistic in that it acknowledges an immaterial overlay over the visible materiality of the body. This overlay cannot be objectively measured by a mechanical instrument. However, it can be perceived and sensed by the “instrument” of the practitioner. This immaterial overlay is called Qi (pronounced as Chi). When your acupuncturist talks about your kidney Qi, she means not just the one-and-a-half pound, bean-shaped organ by your waist, but a whole bunch of other stuff having to do with your psyche and emotions as well as ancestral influences. At the same time, Qi is also not a religious or spiritual belief. Nor is it associated with a Spirit or Godhead. It is not relevant to talk about Qi in abstract form without a material medium. Qi is an actual empirical experience that can be consistently taught and trained through Qigong, the practice of Qi. One should not believe in Qi, just as much as one should not just believe in the taste of a fresh, juicy mango. Qi is to be experienced, felt, and tasted. In that sense, Qigong and acupuncture are akin to a scientific process as both of them emphasize “data”; however the data of Qi-related practice comes from our own perceptions. In contrast to being reductionist, acupuncture is holistic. It says a complex system such as a body has its own intelligence, which cannot be known by only investigating its parts. A car is not a complex system. Its mechanics can be totally reconstructed by knowing its parts. The human body is different. You will never completely understand a human body by studying its parts. Thus, Chinese medicine made little attempt to study anatomy during its two-thousand years of history. 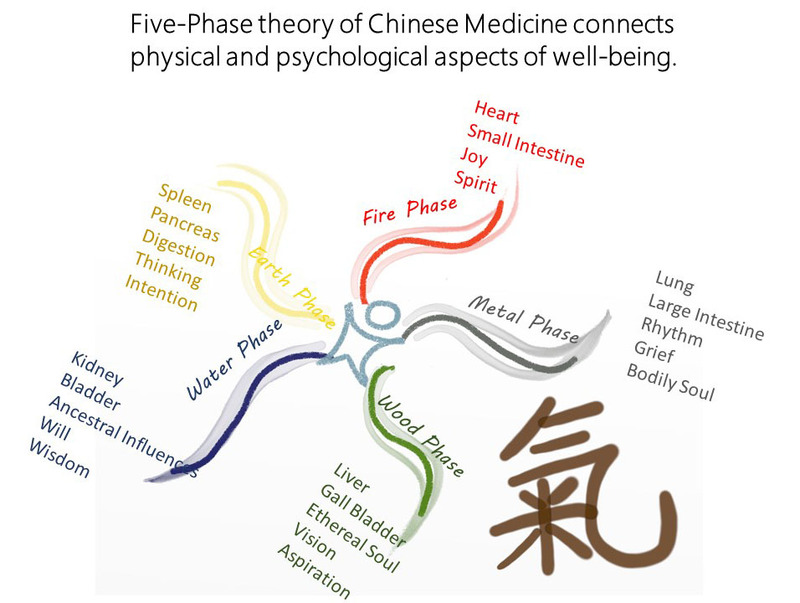 It heals the body by promoting the inter-connectivity between different parts, such as liver and lung, and encourages them to “communicate” with each other using the systemic language of Qi. In western medicine, a hepatologist and a pulmonologist have a hard time communicating with each other. Western medicine is very much developed in specialties. Each separate specialty has a rich repertoire of terminologies that can be opaque to anyone but the specialists. A traditionally trained Chinese medicine practitioner must become “fluent” in speaking the language of Qi at the systemic level. She trains and refines her five senses as instruments to see, hear, smell, touch or even taste the patients! Through synthesizing the complex signals from all senses, she derives a pattern about the patient’s Qi. Then she conducts healing by activating resonance between her own Qi and her patient’s Qi, with the mediation of needles. In fact, skilled acupuncturists can evoke resonance in a patient’s Qi without needles. For western medical practice, this is unthinkable. A western doctor primarily applies his intellectual faculty and the host of laboratory instruments to diagnose the patient. A western doctor treats with pills or surgical tools. Often his sensory faculties play only a minor supporting role, and he mostly keeps his own body out of the equation. You may say, wait a minute, my acupuncturist never does any of that! She asks me about my symptoms, and then sticks the needle in me. That’s it! Not much different from the western doctor. This is exactly the sad reality of the ancient wisdom of Soft Reality science in the modern age. In the Hard Reality dominated modernity, Soft Reality practices themselves are subjected to the cutting of materialistic and reductionist approaches. Acupuncture as well as many other indigenous practices and rituals from pre-industrial times have been co-opted and appropriated by reductionism. Both in modern China and the west, acupuncture has already been greatly reduced from its traditional way of practice. More like western medicine, instead of prescribing pills, the acupuncturist now prescribes “points” to treat. Moreover, the traditional cultural and economic relationships that supported the old way of practice have been replaced by the capitalistic economic structure, driving the old way into extinction. For example, the palpatory procedure in which the doctor “listens” to the Qi of patient’s body was a critical step to engage with the Soft Reality. This procedure is not taught at most schools and is not seen as valid. Nor is it paid by insurance companies. It was after I realized that my beloved healing art was not immune to the reductionist approach that I decided to quit acupuncture as a profession. I remember weeping in my heart when I was sitting in an insurance company’s seminar to discover that that I would be paid by the number of acupuncture points performed on a patient. I felt insulted and humiliated on behalf of my grandfathers. Can you imagine Mozart comes to China and plays piano on the street to a crowd of people deaf to his music? Not only that, they see his playing as a mechanical activity and decide to pay him by the times his fingers pound the keys? Not only that, they make rules to tell him how to play so that they can streamline the payment procedure? Through my tears, I saw my ancestors sighing in their graves. They gaze into a hazy, distant future and urge me to turn my attention to a much larger “body” …. Now, let us turn our attention to the relationship between acupuncture and climate change. The word “climate” in Chinese consists of two characters. The first one is 天, which means “sky” as well as the set of natural laws that govern how Earth and celestial bodies are in relationship with each other. The second character is 氣. Guess what, it is the Qi. So to the Chinese, climate represents the Qi, the immaterial overlay of nature, all the “stuff” that the materialistic and reductionist Hard Reality science has invalidated, ignored or subjugated as “secondary” properties! Not only were the ancient Chinese aware of Qi, the immaterial medium that connects between different parts of a body and speaks the intelligence of the body; they also recognized that nature, just like our human body, communicates between its different parts through its own Qi, the climate pattern! Credit: Jason Hunter’s original work under creative commons. The original work is modified. The Qi of nature and the Qi of a human are inter-connected. In Chinese medicine diagnosis, we would use the atmospheric factors to describe the quality of Qi in a person, such as heat, cold, dampness, and dryness. 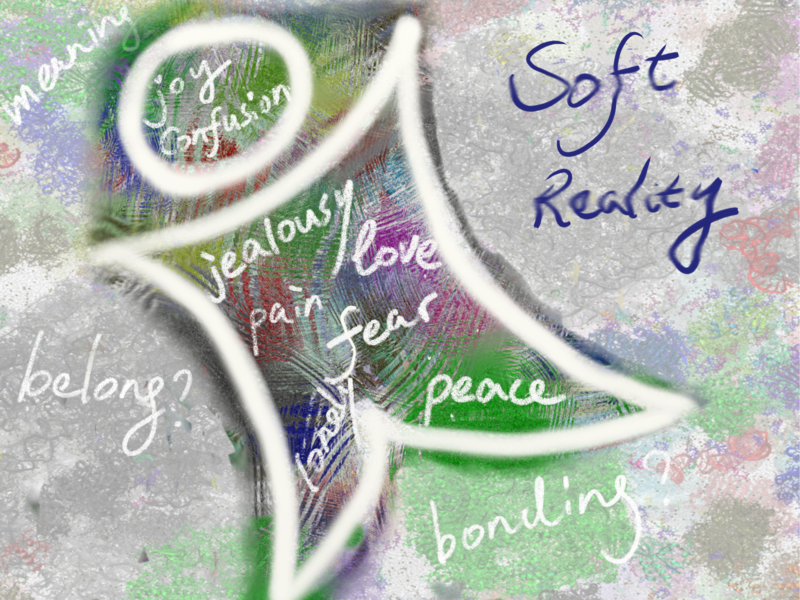 And each of these atmospheric factors is associated with a spectrum of emotional quality as well. In Chinese language, the character Qi, 氣, is also associated with psychological and emotional qualities ranging from bravery, determination, compassion to resentment, ill intention and wrath. Qi is simply the non-dualistic potential, able to express itself through all spectrums of subjective experience. In other words, the climate of nature and the climate of our subjective, emotional experience is a continuous whole, with one influencing another. Maybe quantum physics just started to break into areas of knowledge that would one day provide us with logical explanations of how the internal climate and the external climate continually influence each other. For now, we know that climate change is calling humans to collaborate at an unprecedented scale and depth. It is calling us to embark on an incredibly challenging journey. Through this journey, we will have the chance to re-forge the kind of intimacy, trust and synchronization that we once only shared among a small community of blood-related family. The immense crisis we collectively face right now plus the power of modern technology is rapidly activating that level of collective agency. However, there are complex “climate patterns” in front of us, patterns formed out of the legacy of our civilization, such as patriarch dominance, racial oppression, and implicit power dynamics set in place by economic structures. If we don’t know how to navigate these “climate patterns”, there is little chance we will reach the kind of collaboration needed to navigate this journey safely. What Will the Acupuncture of Collective Climate Patterns Look Like? After I closed down my acupuncture clinic, I was determined to bring what I learned about Soft Reality science through acupuncture into a wider realm of applications. With my partner Joe Shirley, we have founded Resonance Path Institute. We have distilled the principle of resonance as a primary agentic process of Soft Reality. 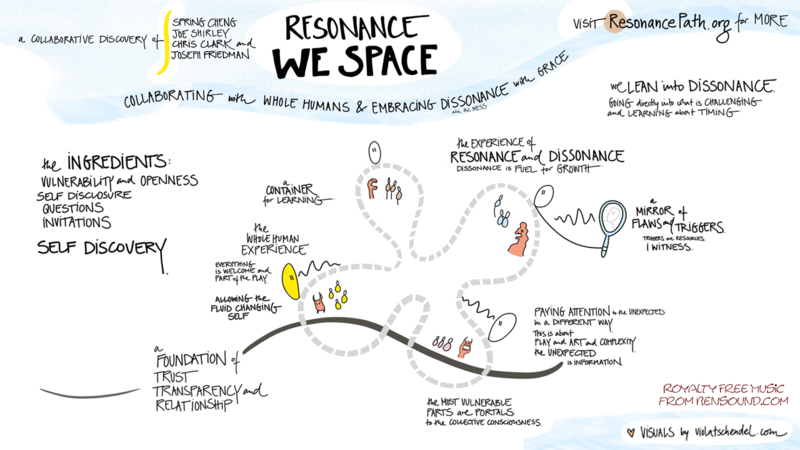 We teach the principle of resonance through innovative ways of social organization and collaboration, starting from individuals relating with themselves. We have participated and worked with many individuals and groups who are passionate about reinventing ways to organize social collaborations and facilitate cultural paradigm shift. What can we learn from the Soft Reality science of acupuncture to treat the body of nature and restore the balance of Qi? First, we may shift our view and see climate change as an invitation from nature to humans, an invitation to learn how to work with Hard Reality and Soft Reality in harmony and mutuality instead of an antagonistic struggle of dominance. From the perspective of Soft Reality, climate change is a set of symptoms that reflect dysfunctional patterns of human relationships in our culture. My colleague Robert Gilman at Context Institute in his talk What Time Is It has presented a brilliant analysis, pointing out that we have sufficient technological resources to solve the problem on the material level. What stands in the way are the immaterial issues: inertia of old ways of thinking and being; resistance to changes; fear of losing short-term interests; and deeply ingrained beliefs, assumptions and attitudes that block us from trusting each other in the kind of collaboration needed to deploy those technological solutions. We need the Hard Reality Science to solve the technological issue, and Soft Reality practitioners to apply resonance to work with soft issues. When we stop the war between Hard and Soft Reality and learn how to navigate the uncertain future with both, there can be so many amazing discoveries about the nature of the universe and ourselves. Second, we are simultaneously the acupuncturist and the “points”! Hard Reality science exerts its power through machines and technological inventions. Soft Reality conducts its power through its powerful instrument, human beings. To conduct acupuncture on climate change, we need willing individuals to come forth as “acupuncture points”, to resonate Qi for nature and the web of human relations. The way we serve as the acupuncture points for nature is to commit to a much deeper changing and learning process than we have all been used to. Our very own changing and learning is where the inter-penetration between reductionism and holism, material and immaterial will first happen. Those of us who are experimenting with cultural paradigm shifts are the natural candidates as “acupuncture points”. Since the 70s, Soft Reality technology in the form of many eastern mysticism practices has been introduced to the west and spawned a wave of cross-cultural learning and discoveries. In my 23 years of living in America, I have come across many western renditions of eastern Soft Reality science. Seeing my own culture and tradition from this new angle has catalyzed incredible transformation in me. To that I am forever grateful. At the same time, I also acutely feel the immense gravity of western psyche’s unconscious engagement with the ancient Soft Science through the habitual materialistic and reductionist approach, so tenaciously pervasive in western culture. Many of the eastern practices were introduced into the west and attached to fixed forms. For example, acupuncture is associated with treatment of pain by poking needles into points. Taoism is associated with practicing TaiChi in a beautiful natural setting. Buddhism is attached to meditating quietly on a zafu in retreat centers. These are no doubt valid forms. However, these forms are only expressions of a vast, dynamic field of rich essence, with complex and nuanced meanings and associations relevant to the cultural, economic, and social relations in its native environment. If these forms are productive fruit trees, the essence is the fertile rich soil these trees are rooted in. Of course, without close contact with the history, culture and language, a westerner has little access to the essence. Practicing forms is immensely valuable in itself. However, equating those forms with the essence reduces these Soft Reality practices into reductionist representations and dilutes their potency. That is what is happening to acupuncture and many other indigenous practices. The tree has been uprooted from the soil. It still produces the fruit, even bigger and more beautiful looking. But the fruits have lost the original flavorful taste. On more than a few occasions, I met westerners who have learned about esoteric eastern practices in English with little knowledge about either the original language or culture, and claimed their knowledge is substantial enough to promote themselves as a master. I very much admire western people’s entrepreneurial spirit and drive for self-sovereignty. However, when people take those sacred names coming from thousands of years of tradition without continuing to nurture the sources through deeper learning, they are committing the same act as modern technology is committing to natural resources: taking without giving back. Yet they themselves are the primarily victims of this act. Practicing Soft Reality technology in the materialistic and capitalistic society without the nurturing support of traditional sources can be a very brutal business. This phenomenon points to a pervasive “point” in western culture. Driven by the habit of reductionism, it has become imperative for people to always take the stance of knowing. Education and society rewards those who know and marginalizes those who don’t know. That has instilled a habit in the western psyche to always reinforce the stance of “I know”, resisting the stance of “I don’t know.” This habit closes people to more nuanced experience and learning necessary to replenish the source of knowledge. In fact, I would extend this to say that when dealing with a complex issue like climate change that calls for a more holistic approach, claiming that we know the answers could be dangerous. We don’t need to be perfect and all-knowing to engage with Soft Reality. However, we do need to be open, nimble, fluid, and always ready to refine and re-calibrate our existing knowledge. A commitment to continuous learning and changing is absolutely necessary for any practitioners of Soft Reality science. The reductionist view of Soft Reality also shows up in people’s attitude towards indigenous people. For many environment-oriented social gatherings, meeting organizers like to include indigenous people’s presence. I appreciate their intention. However, I often feel the presence of indigenous people is more like a superficial display without much substance to it. Seldom are indigenous people consulted for important decisions, even though it is often their lands and livelihood which are most affected. Again, in modern culture that privileges intellectual knowledge over other types of knowledge, “less-educated” indigenous people are generally viewed as less capable or developed. The flip side of the dynamic between east and west is a blind worship of anything esoteric from the east, without applying a critical view. Eastern esoteric practices are extremely dynamic, diverse, often intimately related with environmental and cultural contexts specific to the land where they originated. A healthy, experimental attitude to investigate their relationship in new contexts is essential for a grounded practice. This point is not a criticism to any individual. I have met many western Soft Reality practitioners whose dedication and commitment has inspired me tremendously. What I offer here is my observation of how Soft Science interacts with the socioeconomic systems in the modern western world. Yet these socioeconomic systems are nothing but an expression of the “genetic makeup” shared by the collective psyche. And everyone of us living in the system carries a representation of that genetic makeup in our own psyche, with or without our conscious awareness. I offer my observation as an invitation for readers to go deeper into the essence of Soft Reality science beyond the constraints of reductionist mindset. The collective wisdom of humanities provides infinite legacies of ancient Soft Science, waiting to be re-discovered and re-invented to meet today’s challenge. For us easterners, there is equally so much to learn from western culture. The reductionist approach is a weak point in eastern thinking. This weak point renders its Soft Reality technology vulnerable, nonspecific, and inconsistent. It also makes it elusive and opaque, thus susceptible to misuse. It has been a tremendous learning journey for me to absorb from western thinking and explore how to enhance the efficacy and specificity of eastern practices with a more reductionist approach! To serve as “acupuncture points” for the collective climate patterns can be a sacred privilege and incredible experience. It connects us directly to the field of collective (un)consciousness in an embodied way, through our felt sense and experience. As these acupuncture points, we need to embrace our imperfection and vulnerability, instead of trying to control it, mask it or even heal it! Our deepest wound is the very portal through which we can have direct contact with the Qi of nature and the collective climate pattern. In fact, a more precise translation of Chinese character 穴 for acupuncture point should be cave, a cave into the infinite source. Our deepest vulnerability is that cave. More about these materials will be released in our book The Resonance Path scheduled to be published in May. Third, we need to become aware of the “climate” we are making in all the relations we participate in. When a group of people are called together by a common project, we are making our “climate patterns”. The results and deliverables coming out of the project will carry the stamp of these climate patterns. In my experience of working with groups, I find often little attention is given to the kind of subconscious attention that blocks the Qi of the group. These subconscious activities include subterraneous resentment towards one another, bruised ego, insecurity, power or ownership struggle, and resistance to listen to each other’s views. Often this blocked Qi comes from attachment to the “hard” meaning of language, and a lack of specificity and depths of one’s authentic experience of the moment. We call these patterns dissonance. When we bring passion, commitment and personal investment into a collaborative project, dissonance is totally natural and necessary! Just like a body goes through phases of illness and wellness, the ebb and flow of Qi is normal. In fact, dissonance is the very sign that shows us the potentials and opportunities. The problem is that we often feel so much is at stake if we communicate dissonance with each other. We take it in as personal, rather than a sign of the system speaking through us. As a result, the system we are forming is bogged down by stagnant Qi or hidden dissonance, lurking in the darkness, waiting for a weak moment to explode into crisis. This essay is an invitation for deeper dialog and co-explorations. Climate change is an issue that sits perfectly at the junction between Hard Reality and Soft Reality. These two sides of our reality have been locked in a struggle for dominance for millennia. What an exciting opportunity we are facing, if collectively we may carve a new pathway, to weave a new relationship between these two sides of reality! With that, a vision comes to me. In this vision, people from all walks of life who are called by the issue of Climate Change would come together. They may range from politicians to indigenous tribe members, philanthropists and stay-at-home parents, climate scientists and community leaders, engineers and city planners. They would offer themselves as the “acupuncture point” and work with their Soft Reality climate patterns as they interact with each other as representatives of their family, ethnicity, profession and country. Dissonance will arise. Guided by the principle of Resonance, people will bravely lean into it and allow it to lead us to new discoveries and emergence. From there, they will create a space to invite nature to “speak” and participate in co-creating solutions to solve Hard Reality problems that involve sections of our culture that have been conventionally segmented. 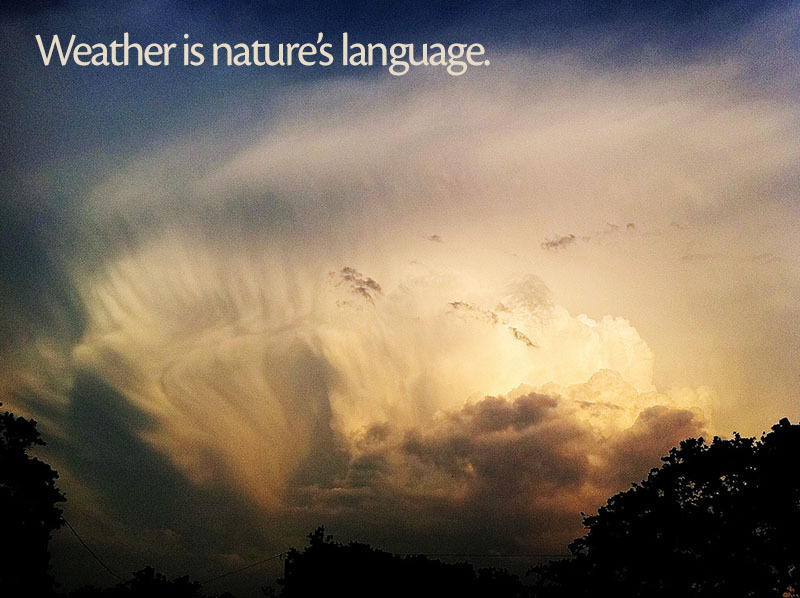 In my beloved language of Chinese, climate means the Qi of nature. It is reminding us that nature is the larger body, and we are each a cell of this body. Both the cell and the body have their own level of intelligence. If either the body or the cell claims the dominance of its intelligence without the awareness of the other, we have diseases. Nature’s body has its own will, intention and mood, related but standing independent from us humans. What will it be like when we learn to speak its “language” and listen to what it wants to say to us, as opposed to always imposing our language and value system onto nature? I don’t know what that will be like. But I will guess how I would feel about it. I would feel more intimately connected with the flow of life around me, including the storms and inclement weather. I would be in constant wonder of this ongoing dialog! What will it be like when we re-weave the fabric of our culture and society from this place? What a fine and timely essay. I find myself thinking/dreaming of groups of people in geographically powerful spots becoming individual points and systems of points connected in hard/soft reality with a specific intent to release the blocked/stagnant Qi of climate and also to create energy for work to shift the Hard Reality spheres of politics and social opinion. Otto Sharmer, whose work I generally admire writes about “acupuncture points” for social change in Leading from the Emerging future but his understanding of acupuncture is unfortunately only at the level of analogy. CONGRATULATIONS ON YOUR BOLD ANNOUNCEMENT OF A BOOK IN A MONTH!!!!! What a marvelous essay. Thank you! You offer a very clear and inviting way of knowing that is anchored in the Classical Chinese tradition. This feels very important and timely. You contrast this with the power to know through scientific reasoning (which is the Western patriarchal tradition). I feel sometimes that the latter is almost (but not quite!) insurmountable. Its power comes from having proven itself to be very successful in bringing the Western world so many material goods. The more analytic approach of the Western Patriarchs brackets feeling and action to emphasize only analysis and distanced observation. I have noticed how the “Fathers” of this powerful, almost omnipotent method, are men whom we would today describe as having relational problems (Newton, Descartes, Bacon…). The personal – or actually the impersonal in their barren lives – became a form of epistemology! Ironically their system of thought – which is the foundation of all conventional Western education -has been so very powerful that we have blind to its toll. Until recently. Its power is reinforced by simply dismissing any knowledge that is not objective; and rewarding objective knowledge with grants and funding and ego enhancing titles such as “Dr.” and “Professor.” In all this it has become a force almost equal to nature, (itself rather awe inspiring!). Its hard to argue with such success. Except of course that now we are noticing that climate change and other catastrophes have been caused by this very way of operating without regard to nature and experience. Its interesting to me to see the mix of New Age and Conservative voices that simply deny science (the former with vaccinations and the latter with Climate Change). It’s as if somehow they intuit that the very rules of (Western patriarchal) science themselves are too limited. Their suggestion that we simply ignore the problems does not seem so wise however! Here the ancient Chinese system would agree with them on the problem and offer a solution. As such what you offer is, I think, a cousin of a larger family. That family is made up of those who intuit something is wrong with Western objectification (all head, no heart). That family may be called “indigenous knowing” or experiential knowing. It’s a family that takes emotion and action as equally serious with analysis. Western cousins include feminism in general and other democratic approaches, I’d say psychoanalysis too. All cousins – all of them placing experiential / in-tuition at the heart of the matter. Those of us who work with the action research paradigm also feel part of this family. What this family shares – I believe – is placing personal experience (not analysis) at the center of our knowledge creation processes. Hence subjectivity and relationship matter a great deal to those who care about integrating subjectivity. While the ancient Chinese system may be more advanced than these younger “experiential learning traditions” of the West (such as action research, psychoanalysis, feminism…), they can likely accomplish more together, knowing and celebrating each others efforts. All is not lost even in the West. The scientific method is just a few centuries old. We need a counter valuing success. The idea that in-tuition (teaching ourselves) is possible was also there in the Greek tradition. Now we need to reassemble the fragments – some of which are Chinese in origin and some of which lie in other indigenous and marginal voices. I feel with you that this is the work we must undertake, namely to take our own intuition and experience seriously as transformative knowledge creation. To get away from knowledge colonization to knowledge democracy, to multiple ways of knowing. Seems so simple, yet there is such a force in our world for us to ignore inner authority – which of course benefits those who already have authority. Thank you for this essay! I see in the Chinese system – as much as I understand it – a methodology for systematizing intuition in tandem with an understanding that self is a microcosm of global. I join you in that as an action researcher.